One of the less reported on pieces of news from Apple's WWDC event yesterday was the fact that you can now delete Apple bloat from your iOS devices. 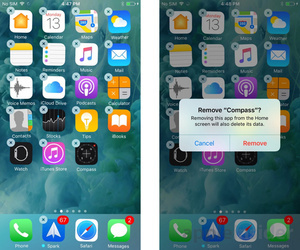 With the launch of iOS 10, you will be to remove all apps from your iPhone and iPad, including Apple's own pre-installed apps that you never use. A few of the apps that are expected to see quick deletion are Watch (for non-Watch owners), Compass, Tips, Stocks and Podcasts although there are plenty of others that could go. As a secondary function, Apple has added the native apps to the App Store, allowing you to download them all again if you ever want them back.